Sometimes I love leftovers. Like when I am craving a quick, warm, homey lunch and remember there’s some butternut squash soup and chicken masala and rice in the fridge (that was yesterday). Certain things just taste better, too, after they’ve had a couple of days to mellow and refine (like the lemony spinach-tomato-feta-orzo salad I’m enjoying for lunch right now—it’s always better 48 hours after it was made). At other moments, I hate leftovers. Like when I really want an excuse to eat lunch out or to make a big, fresh, gooey grilled cheese, but I know there’s something in the back of the fridge that must get eaten in the next 24 hours or it will have to be dumped. When I was growing up, my mom was the master of creating an appetizing feast of leftovers, maybe about once a week. Before we had a microwave, she had special techniques for reheating tricky foods. She would make patties out of leftover mashed potatoes, for instance, and pan fry them in butter. It was like a whole new food. My mom is smart with her planning and the food budget, plus she’s careful not to waste. On top of that, pulling out all the leftovers gave her something like a day off her cook duties. I’m lucky to have that model (even though I can guarantee you my mom never pushed something questionable deeper into the fridge). I’m also lucky to have a husband who never seems to tire of cooking. I love to cook, too, so we have a nice tag team approach to meal planning and I don’t have a chance to get burned out. Jason isn’t a fan of leftovers, though. He’s not sure why. Sometimes when he comes home for lunch he can enjoy certain leftovers, but they never grace our dinner table. Never. 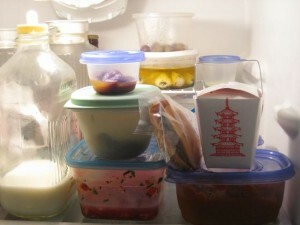 Leftovers have been on my mind more than usual since Jason and I took a closer look at our food budget last month (I wrote about it in Calculating the value of dinner). We really can’t afford to be wasteful right now. It doesn’t matter that our finances haven’t changed. It’s still a good time to adjust our lifestyle. I started thinking about leftovers as a metaphor last night. I was commenting on a post by Eliacin Rosario-Cruz, on his blog Kingdom Praxis. He and The Mustard Seed Associates team are putting together an alternative calendar of activism, observances and celebrations. The purpose of the calendar is “to highlight ways to celebrate the ordinary events of life…giving them a Christian focus.” He then writes “Imagine fellow conspirators all over the world celebrating Kingdom alternatives together.” Such a cool idea. So…what about a day to Thank God for Leftovers? I know, kind of strange, but bear with me. Invite a group of friends over for dinner, telling them to clean out their fridge before they come. Together, create a banquet of leftovers. Serve everything right in the Tupperware. Let go of your need to have everything perfect when you have people over. Try a bit of this and a bit of that. Eat Mexican and Chinese and American all on the same plate. Celebrate foods that don’t go together perfectly, and find new tasty combinations. Compliment one another’s cooking. Enjoy some leftovers you didn’t make and therefore aren’t eating for the second time. Most importantly, be thankful that you have enough to have some left over in the first place. And recognize that even when you gather up the crumbs and scraps of all we’re given, there’s enough to make a satisfying feast. This is such a fantastic ideas. Thanks for the link too. You’ve seen my freezer. It’s all about leftovers. The potluck with friends could be great — if they actually cooked enough at a time to have leftovers. Many of my friends cook just enough for that one meal. We had that one Thanksgiving a few years back. Just little bits of everyone’s leftovers. It was great fun. At my house, we (okay, only I) call it Festival of Leftovers, and I make sure to be extra-festive when I say it. Five minutes later, there he’d be cooking away and we never left the house. I don’t miss him but I sure do miss that.